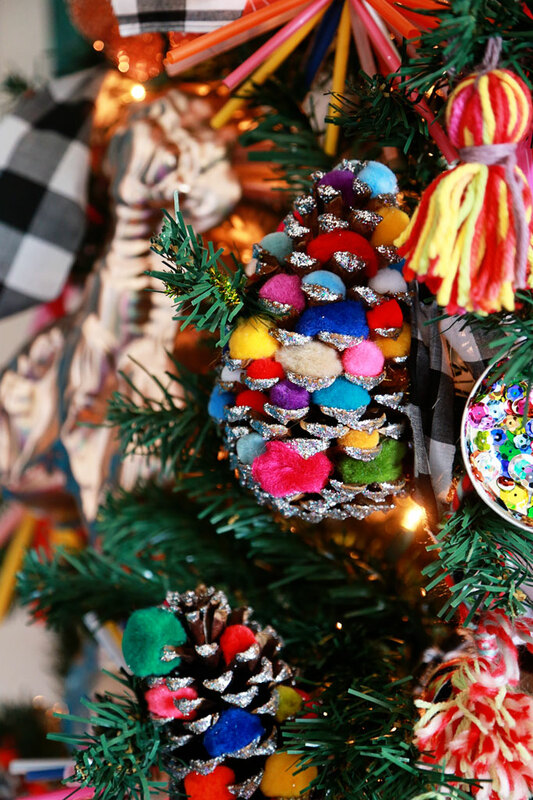 Sweet, I’m totally making those pom pom pine-cones to add to the tree this year (and they will go fabulously with the pom pom straw garland from last year). 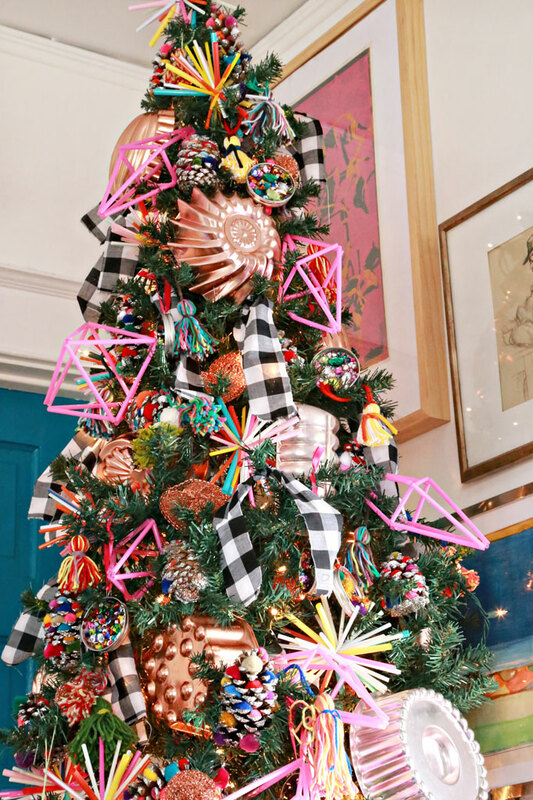 I’m really digging the black and white buffalo check gingham ribbon, I think I may have to pick up a couple of yard to use as a tree skirt for my tree. And I know I’ve said it before, but I have to say it again I love that black and white dresser (it was what lead me to your blog so very long ago). 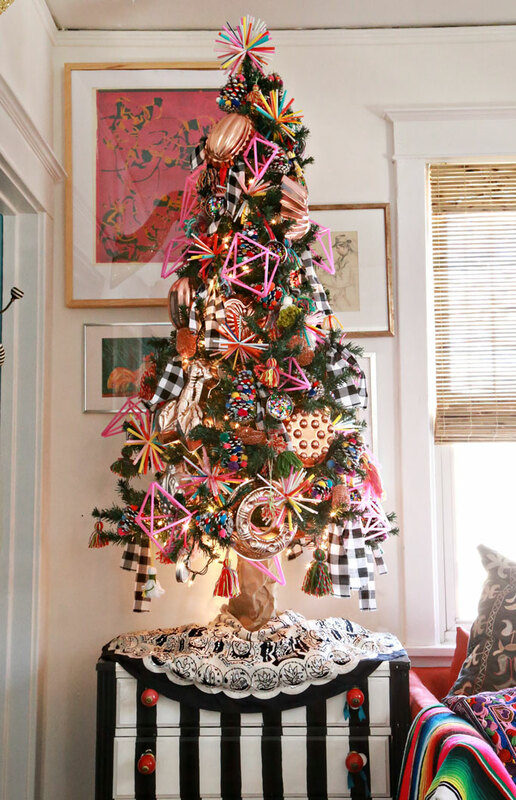 This is my favorite tree of yours so far this year that is till the flamingo’s fly in, and then I might change my mind. OMG! Sacrilege! 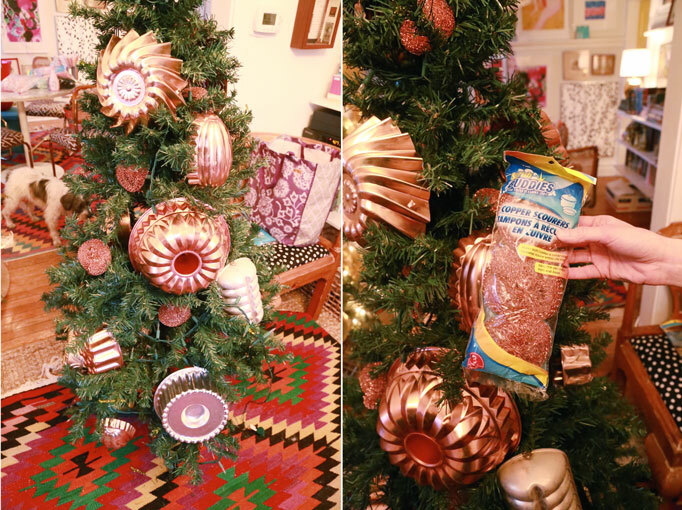 Despoiling good pinecones with pom-pons! I have to go have a contraband Diet Dr. Pepper to calm down. I think you need a meeting. Crafters Anonymous. 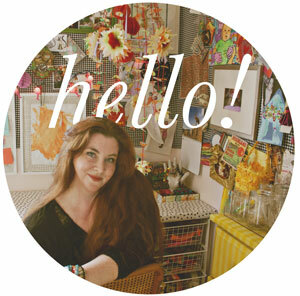 Craftaholics Anonymous is actually a pretty good site. And I LOVE my pinecones. I really like your tree. It’s beautiful, unique and gives off a lot of creative energy. Every time I see that lobster mold in one of your photos, I think it’s a, erm, adult themed mold at first. I’m sorry for my brain. 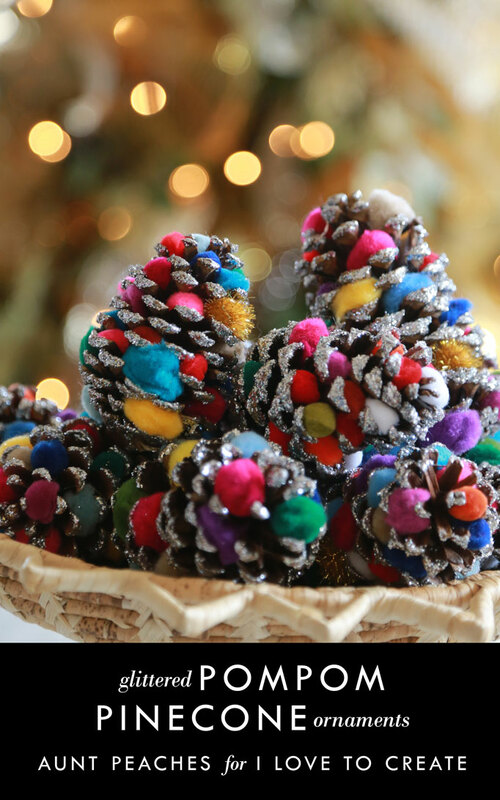 Absolutely love the glitter pompom pine cones! And the tassels. Your first tassel post should have come with a warning: more addictive than heroin. I am still making them, and I can’t seem to stop! I keep searching for new ways to use them, so far I have added them to my dream catcher, my light fittings and made a garland. Other plans are for my Christmas tree, another light fitting, a blanket edged with them, possibly a wreath, and now I’ve seen your napkin rings, some of those too. Any further suggestions would be welcome, and if you know of a good tassel-makers 12 step program……. Ha! Great minds think alike 🙂 I am a bit addicted too. I started keeping a stash of yarn and paperback books next to the sofa so I can make tassels while watching trash TV. Makes me feel all useful and stuff. I’ll let you know if I can think of any other cool ways to use them….it’s bound to happen! Pom Pom Pine Cones! Pom Pom Pine Cones! That’s going to be my go-to phrase for this holiday season, replacing Tough Tinsel, when I need a good all-purpose replacement expletive. And then I think I’ll MAKE some of these little packages of festiveness because they are so darn cute (with glitter, but of course). The straw-bursts (that’s a combo straw/star burst) are truly funky, and I like them. Thanks for the cool ideas! I really can’t figure out how to make the drinking straw starbursts. Please, a little tutorial? I’ll need something to make once my house is overflowing with tassels! Am breathless…have no more room for copper molds…then again, maybe! As for tassels; I am afraid! Very afraid! You may have lead me to the dark side, Madame Peaches!! I really love the Michaels tree you put up, but this is so “you”! Fabulous! Gah! 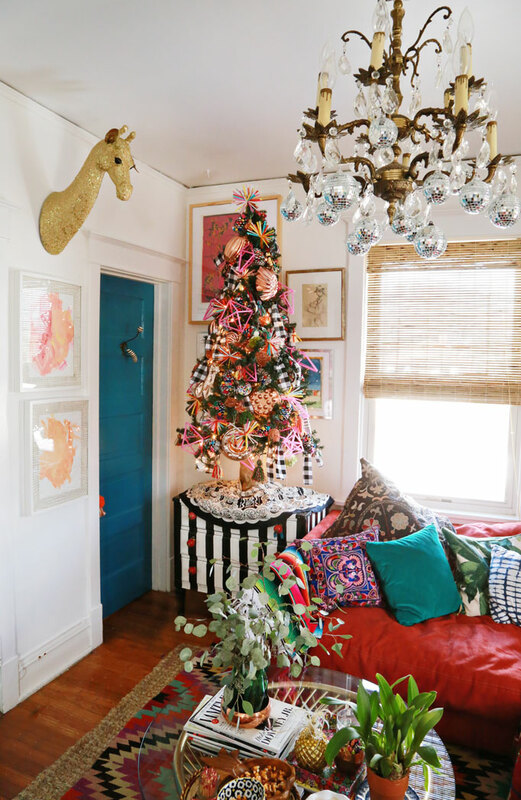 Come decorate my entire house. Now. Did you ever get the New Kids on the Block Christmas Album? 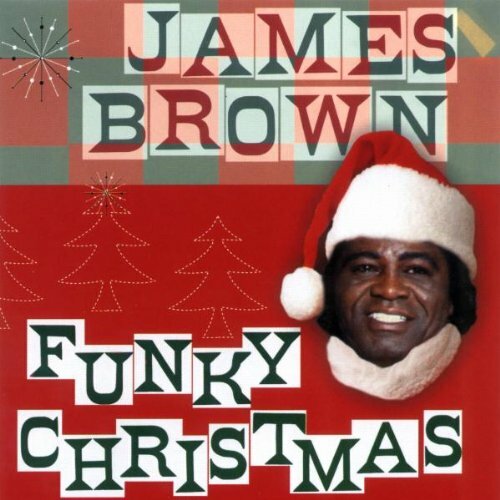 Have a Funky, Funky Christmas! Shhh. You known darned well I was listening to it yesterday! Truly imaginative and creative, love these ideas!